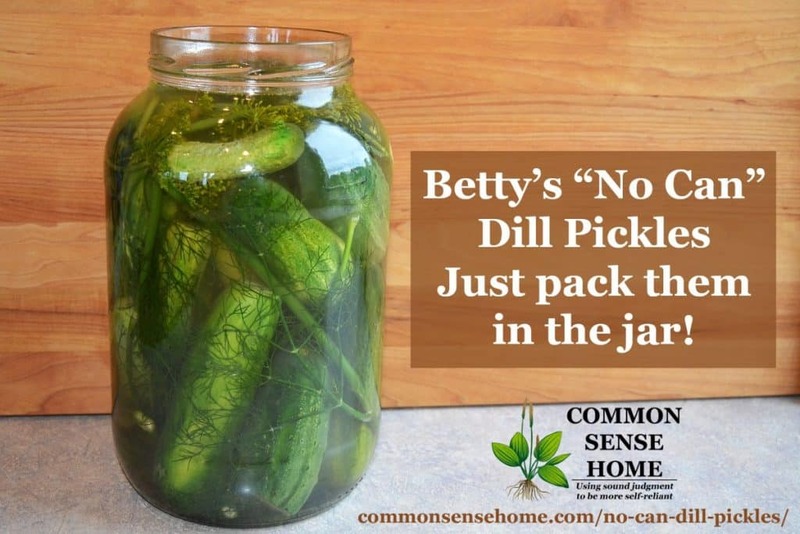 You are here: Home / Recipes / No Can Dill Pickles – Just Stick Them in a Jar! This recipe is from my neighbor Betty. Betty and I have swapped a lot of produce and recipes over the years (she's also my son's piano teacher and has become like a grandmother to him 🙂 ). 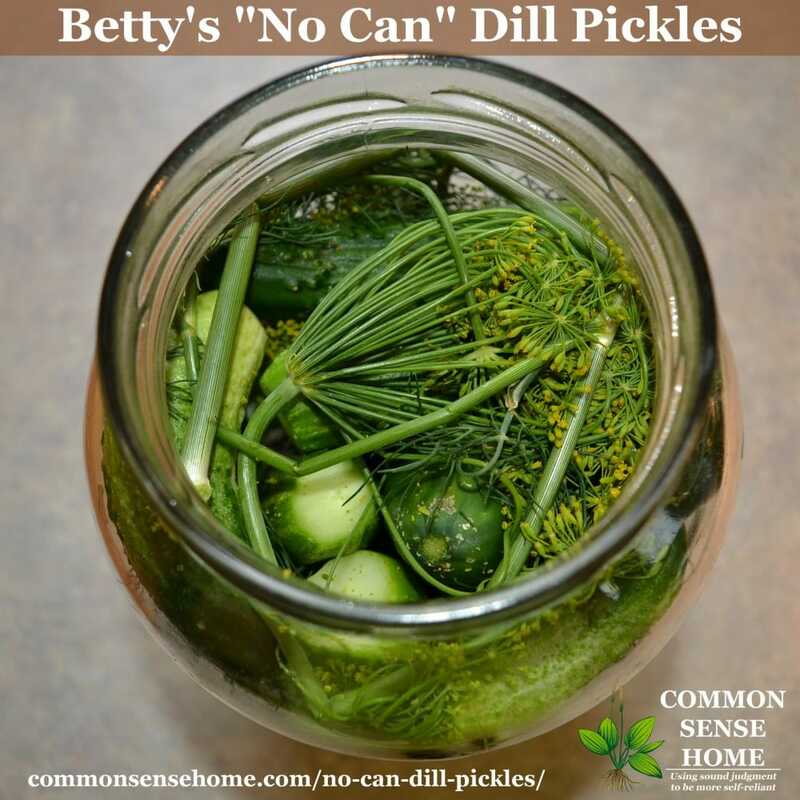 Betty makes a simple old-fashioned brined dill pickle that doesn't require canning, and couldn't be easier to make. Combine the water, vinegar, salt and sugar and boil one minute. Cool slightly. Wash the cucumbers and cut off about 1/16”from each end. This gets rid of some enzymes that would soften the pickles, and allows better penetration of the brine. Pack the cucumbers in a one gallon jar with the dill. Note: I like to curl up some of the dill in the top of the jar to pin down the cucumbers and make sure they all stay submerged in the brine. Pour the warm brine over the cucumbers. Let stand, loosely covered, at room temperature for three days. (Drape a towel over the jar opening or let lid sit on loosely.) I rubber band everything, especially in fruit fly season. You could also use something like the Picklemeister Glass Fermentor Jar, which in addition to being fun to say, comes with its own airlock built right into the lid. Cover and store in refrigerator. They are ready to eat after the three days but the flavor improves after a week or two in the refrigerator. That's it! No canning, no heat processing of any sort. These pickles stay fresh and crisp tasty for months. We've enjoyed them at Christmastime. If you don't have a lot of small cucumbers, you could cut the recipe in half, or make up a full batch of brine but process pickles by the quart and hold the reserve brine in the fridge for a couple of weeks. Delicious! Thanks, Betty. I love my country neighbors! Super easy no-canning required dill pickles. 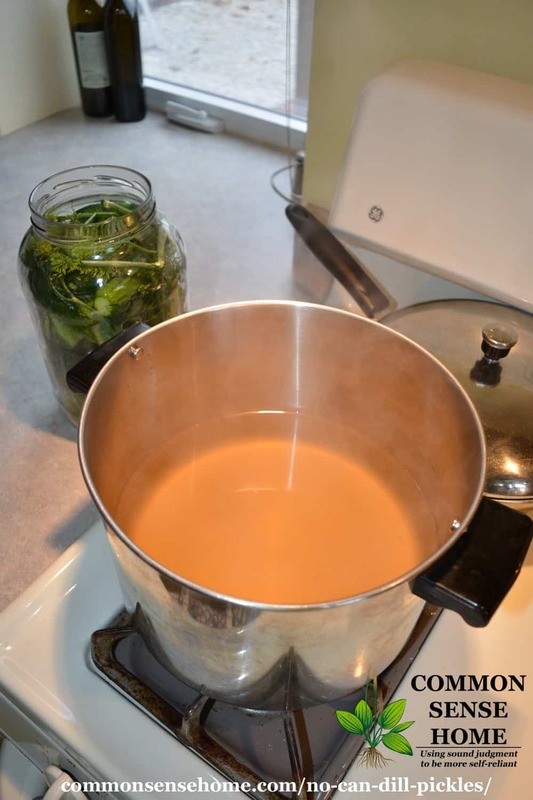 No canning required, store in the fridge for months. Pour the warm brine over the cucumbers. Let stand, loosely covered, at room temperature for three days. (Drape a towel over the jar opening or let lid sit on loosely.) I rubber band everything, especially in fruit fly season. I like to curl up some of the dill in the top of the jar to pin down the cucumbers and make sure they all stay submerged in the brine. Originally published in 2010, updated 2016. I just tried making pickles the other day for the first time and they turned out great! yum! I need a good pickle recipe too. I want to try this when cucumbers are back in season. In the meantime I still have beets in the garden that I would love to pickle in the fridge. Would this recipe work? or how would you recommend to modify it for beets? Hmmmm…I don’t see a reason it wouldn’t work, if you want dilly beets. Otherwise try varying the spices, but don’t decrease the acid. For hot processing, a grape leaf helps keep them crisp. I refuse to use alum as well. Also, I only hot process my pickles for 5 minutes and haven’t had a problem with spoilage or a seal and they’re crisp. Refrigerator pickles are super easy and yummy though! We have a fenceline covered in wild grapevines, so I want to try that for lacto-fermenting. To keep pickles crisp you can use a leaf from grape vine, oak, horseradish and also 2-3 bay leaves per quart. Put your spices in the bottom of the jar along with the leaf. I’ve never tried refrigerator pickles. I, too, won’t use alum, so this sounds good! This sounds really good! I have been wanting to make my own pickles. I planted my own dill and my silly chickens got into it and ate it all! I will have to try your recipe! I also like the idea of adding the garlic! does it matter what kind of vinegar is used? Apple cider? Pickling? Organic white vinegar with the mother? white vinegar with 5% acetic acid? Angela, I think I love you! I’m smiling as I read your comment. Pretty much any vinegar will do. My personal favorite is apple cider with the mother. I’m sure Betty just used a big old jug of cider vinegar. ha ha!! Well, you’ll laugh even harder when you read that i’m only doing 4 pickles! My sad, nitrogen deficient garden only gave me 4 pickles at once, so I’m using them as a test run for the others that are (hopefully) coming! Garlic scapes and dill are ready to go! and I went with Organic White Vinegar with the mother! We have abundant pickling cukes from our garden this year, so I’ve made a couple batches. First batch, I followed the recipe exactly with plain old white vinegar. Hubby & son love it. My daughter said “You didn’t say these were sweet pickles!” They’re not, of course, but they are sweeter than store bought. I thought maybe so too, so second round, I increased salt to 1/2 C. (I’m using Kosher salt, by the way.) Also, made two jars. Added a dozen cloves of garlic to one. Added a hot pepper from the garden to the other. Better. Haven’t tried the hot pepper version yet, but the garlic version is good. I’m already planning the 3rd round. Next time, I will drop the sugar to 1/3 C. We love them and anticipate having pickles for quite a while to come. Or maybe not. I guess it depends how many we can eat each day!! Lesley – that’s great that you have a house full of pickle fans! My boys would rather eat them fresh than pickled, but friends enjoy the crunchy treats when we have company. Hey There, my family loves these pickles. I am curious if they can be canned? I am not sure we need to worry about it, they won’t last long. you could probably can them, although the FDA might not approve, and they wouldn’t stay as crisp. Do these have probiotics in them? is it possible to exchange the sugar for Stevia instead? The sugar helps bind free water molecules, aiding in preservation, so I’d be hesitant to eliminate it. If you’re looking for a low-sugar/no sugar option, I’d turn to lactofermenting, so that the cultures act as a preservative. I add several cloves of garlic and about a tablespoon of mixed picking spice and one small dried red pepper per gallon jar. Have made these for years. Do you think this would work with coconut sugar as I have people that cant have sugar. Thanks. I have seen it used in other recipes, so it should be okay. The vinegar acts as the primary preservative. Hi! Do you leave the dill in the container once it goes into the refrigerator? Yes, the dill stays in and continues to add flavor. I love the idea of using apple cider vinegar with the mother, but would boiling it for one minute kill the enzymes? If so, why not just use regular? Just curious–do the lactofermented pickles taste different? Yes, boiling does kill the enzymes. That’s the vinegar I usually have on hand, so that’s what I use for cooking and preserving. You can use whatever you have on hand. These pickles are vinegar pickled, not lacto-fermented. They taste like a good standard dill pickle. Lacto-fermented pickles tend to have a slightly more earthy taste. Ok, so this is my first garden and i kinda took over the in-laws garden since we are staying with them right now. And they wanted cucumbers…i don’t really like them, except as pickles, so when i found this recipe i got very excited! I’m off today to go find a big jar and the salt. I do have to ask…what on earth is “cider vinegar with the mother”?? Is that fancy code for something? 😉 I was just curious. lol – sort of fancy, I guess, as vinegar goes. It’s usually what I have on hand, so that’s what I use, but any good quality vinegar will work. Vinegar is brewed using a culture, otherwise known as a mother. This makes “vinegar with the mother” a living food. Most commercial vinegar is pasteurized, which kills that mother/active culture. In this recipe, the vinegar is heated during preparation, which will also kill the mother, so these pickles are not a live cultured food. They are preserved via acidity, sugar and salt. Acidity creates an environment that is not welcoming to bad bacteria, salt and sugar absorb free water from the cucumbers, which also reduces breeding grounds for bad bacteria. I prefer to buy vinegar with the mother because the flavor is a little stronger and more robust than vinegar that has been pasteurized and filtered. It will have some sediment in the bottom of the jar and may be a little cloudy. It’s a little strange looking at first when you are used to clear vinegar, but the flavor is very good. The two brands i see around here the most are Bragg’s and Eden Organic. Without seeing your setup, it’s hard to say for sure. Plant material sticking out above the liquid could cause mold growth. Higher temps could cause mold growth. High levels of mold in the air could cause mold growth. I’ve never run into the problem here in northeast Wisconsin. Air-locked fermentation vessel, to keep out any foreign bodies. This would probably be the most reliable option. They sell these through Cultures for Health, one of my affiliates, and through other online retailers and in some specialty shops. Use some sort of weight to keep all plant matter below the liquid. Use a shorter fermentation at room temperature. This may help if you are fermenting in warmer conditions. Make sure you trim off the blossom ends, as these may harbor bacteria/molds that promote spoilage. I’m sorry the pickles didn’t work out. I’ve never run into problems, but every kitchen is different. Amazon.com stocks Fermentation glass Jar Weights 3 pack (2 1/3″ to fit a wide mouth quart jar) and USA Made Crock Rocks© – Wide Mouth Ferment Weights , as well as other weights for fermenting. Not sure if folks are still reading the comments, but thought I’d pipe up with a couple of years of experimenting. I generally go with 1/2 cup of Kosher salt and 1/3 cup of sugar – we just like them a little saltier and less sweet. This switch is about perfect. I always add something to them. A dozen lightly crushed garlic cloves – they’re still whole, just cracked with a smack from a can or the flat of the knife. Last year, I made a round with jalapenos. If you like a little kick, these are PERFECT! My hubby, who doesn’t like things too spicy even loves them. They remind me a little of Tony Packo’s if you’ve ever had those. I rinsed and cut the tops off of about 8 jalepenos from the garden and put them in with everything else. So good. I can’t recommend this enough. I also did a round with baby carrots. The were quite delicious. If you’re a fan of the pickled veggie mixes from the store, this will make you happy. This year, we’ll be making more pickles, and also more pickled veggies with the mix. We’re still eating last year’s pickles right now – we make a LOT. Everyone loves them. They make great gifts and a great addition to potlucks!! I just printed your recipe off and can’t wait to try it next season! One question can you use homemade apple cider vinegar (mine I just finished fermenting for 4 wks has one in it). Just curious! You could use homemade vinegar if you could test to make sure that it has an acidity of at least 5%. A less acidic product could lead to unsafe conditions. I’m excited to try this recipe, would it work with a reg. Cucumber ? or does it have to be small cukes? You could use larger cukes and cut them into slices, but the whole small cukes stay crisper. Thank you for your very informative and interesting newsletter! My mom did a lot of canning as i was growing up in Crivitz and then Marinette. Can’t wait to try these pickles. Is there such a method of “crock pickles”? I overheard some ladies discussing them, but wasn’t able to qerry them. I’m new to your site and wonder if you have a formula for making sauerkraut, preferably not too “puckery”. Mom made her own in a crock, in the basement. One night we were rudely awakened when the plate blew off the crock. I don’t remember what she did wrong since I was only 10 years old. Thanks for your fun to read newsletter. Cate, you are making me home sick. I grew up in Marinette 🙂 Excited to try these pickles. My usual recipe has far more vinegar. Did you make these? Like these? Thanks. Once the three days is done and I close the jar, must they go in the fridge? Can I store them on a shelf and if so how do I seal the jar? Ferment one quart at a time. With fermented foods you get a wide variety of probiotics which make up 80% of your immune system!!! I’ve made my mom’s refrigerator recipe for decades, and she made them (in Luck, Wisconsin) for decades before that. She added a pinch of alum, which gives it a nice, loud crunch. Mom used to used alum, too, but I generally avoid it due to concerns with ingesting aluminum. Do you have a recipe for kimchi? Thanks. No, that’s something we haven’t tackled yet, but maybe this fall when more cabbage comes in. I have to wonder how pickles used to be made so they could be kept in a barrel in the old country store, and people would simply grab out one to eat when they bought it. That was long before there was refrigeration, or canned/jarred pickles sold on the shelf, and how could they possibly have known the percent of acid in their brine? I wonder how big the barrel was, too! Might have to do some research with my Mennonite relatives and friends…. I’m not Mennonite, but my mother’s mother’s mother was, and it seems wherever I go, I find distant cousins! I have a half-dozen Mennonite cookbooks that were written, compiled or contributed-to by various relatives. … Thank goodness for Google! 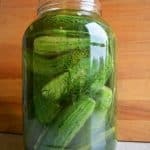 I searched for how to make pickles in a barrel and came up with THIS wonderful site, with very complete directions, for lacto-fermented pickles made in big crocks – and I HAVE some in storage! I think they’re coming out this summer so I can try this! If you’re making these pickles in a glass gallon jar, any small glass plate or dish that would fit through the opening and submerge the produce in the brine should work as a weight. Just make sure the item has been sterilized first. If necessary, a sterilized glass canning jar full of water could be set on top of the plate or dish to further weigh it down. Remember, people have been making pickles for hundreds of years, and they didn’t have all the fancy stuff we do, or the scientific knowledge about bacteria, yeasts, molds, etc. – yet they mostly survived the experience and kept pickling! I think we tend to make processes like this too complicated. And who really cares what the FDA “approves of,” anyway?! I love finding new uses for stuff that carries the dreaded warning – “Federal mandates require use only in accordance with label directions.” Mankind has thrived on discovering new uses for all kinds of familiar things! Since you’re already walking on the wild side, I’d also note that our ancestors didn’t sterilize everything, either. Of course, we’re now dealing with some nasty pathogens that they didn’t have to contend with, so I do try to keep everything clean and follow common sense guidelines. That said, I do still use some traditional recipes as well – as long as the chemistry and biology of them make sense. Bacteria and mold don’t thrive in an acidic environment. Salt and sugar also inhibit bacteria growth by binding up free water (bacteria needs that water, too). I imagine the early recipes came from trial and error, working with local supplies. If it didn’t spoil, you knew you got it right. If your brine is properly acidic, a clean weight should suffice. We have a lawsuit crazy culture, but much of the produce now in grocery stores has a high risk of more aggressive pathogens. One bad lot of anything can get spread across the country, coming with listeria, e coli or other nasty critters. With garden or local produce, most times those risks are reduced. Healthy bacteria are essential to human health (our bodies normally have around 10 bacteria cells for every human cell), so waging war on bacteria is like waging war on ourselves. I hope over time the focus continues to shift towards nurturing good bacteria instead, while following basic safety guidelines like not mixing raw veggies and raw meat unless they’re going to be cooked. I’m bookmarking this recipe! 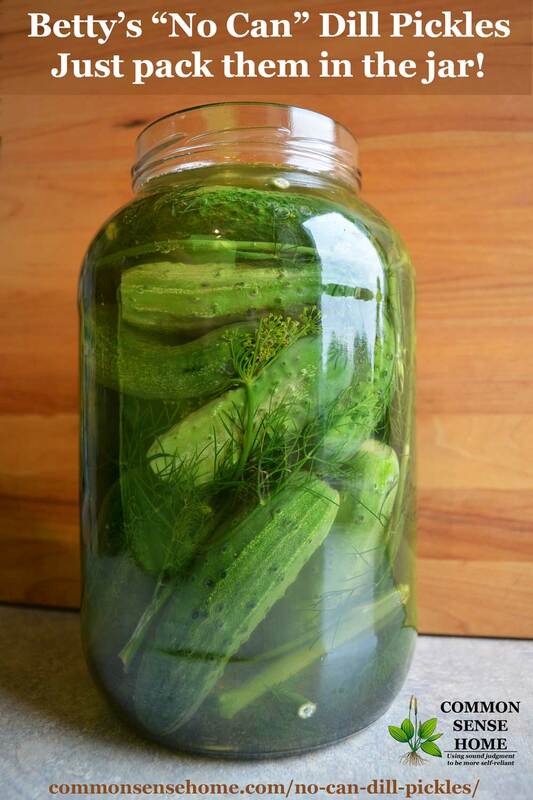 I’m growing cucumbers and dill this summer with the express purpose of making dill pickles. What kind of vinegar do you use? My neighbor used white vinegar, but I prefer cider vinegar. Hi. We live on dill pickles and pickled beets. But since I make over 150 jars of each a year (not counting peaches, pears, stews, meats, fish, soups, etc to the tune of about 1500 jars a year. My husband buried a sea can for me as a root cellar because I feed 13+ people off my canning and preserving), water bathing just took to much time. And like you I want my pickles to be crunchy. First thing I learned is that pickles need to be water bathed at 180 degrees… no change.. and they will stay crisp. So get your water bath to 180 and leave the lid off.. and you won’t have soggy pickles. That solves the crunchy part. For me it doesn’t solve the time constraint. And then I started to pay attention to the elderly. In three countries I might add. Germany, Canada and the USA. Many learned to preserve at the apron of their grammas. So I paid attention. I started hearing that I didn’t have to water bath my pickles or beets.. and of course I was intrigued. The instructions I received were simple. Heat your jars, heat your seals, boil your liquid. Assemble all of it quickly, toss on your lid and tighten the ring… flip upside down and leave for 24 hours. My pickles all sealed. And because everything was still boiling my pickles were still bubbling away over an hour later.. much like a water bath. Like everything this is a personal choice. I decided that this many generations of elderly have survived so I’m willing to follow their lead. I feel everyone has to make the decision on what they feel comfortable with. But I thought I’d throw this into the mix too. I think we’re on the right track when we take control of our food and food supply. Happy canning everyone. What you’re describing is now referred to as the inversion method, and is no longer recommended due to the potential for food to get in the seal during inversion and the possibility of air being retained in the jar headspace, leading to a false seal. That said, if a person were inclined to use inversion canning, pickled recipes would be some of the safest types of recipes to use it on, given the high acidity and salt levels of the pickled produce. Both acidity and salt inhibit bacterial growth. I can not hardly wait to try these. Sound delicious and easy.bthans so much. Love your emails keep them coming. Do you have to use whole cucumbers. Or can you use slices of cucumbers? Whole cucumbers tend to stay more crisp, but I have used slices to fill a jar. You’re welcome, and I’m glad you enjoy the emails and site. Such an easy sounding recipe, and many great remarks! I’m trying this today, the weather outside is hot and humid and will hit high 90’s…I keep the house around a comparatively cool 80. Should they still sit out for three days, or should that time be strongly shortened? I would think you’d still want at least two days, even with the higher temps. Worth noting that I added carrots with the pickles and it was good, but they only lasted 5 days total before they were gone. Also, did not leave them out and put them straight in the fridge because I misread the recipe. I’m wondering what the leaving them out is for, if it’s flavor or something else? Canning is a total time sink, but this is just right. Am now wondering what I can pickle using this recipe during the fall and winter. The time on the counter helps them break down a bit and soak in the brine before stabilizing them in cold storage. It develops the flavors more. Hmmmmm… I made another batch, except with green beens. I actually put them right in the fridge for a week, and then left them out for a few days. They definitely were fermenting. The liquid turned cloudy, a white sediment settled at the bottom, and the liquid (and my beans) became carbonated. And they were awesome. The thing is, it’s not a full blown ferment. It’s a vinegar pickle, which is a different beast. My pickles don’t get fizzy. I have not done a detailed study of vinegar pickling, but I know that the pickling solution draws the moisture out of the veggie. The bacteria that cause spoilage like things warms and moist. So we draw out the moisture, then we drop the temps. I tried the no cook dill pickles and i curled up dill on top of the pickles. Some of the dill wasn’t under the brine and it molded. Will my pickles be ok? I took the molded dill out and spooned the little bit of scum off the top but one jar it turned the brine cloudy. I used 6% vinegar and kosher canning salt and I boiled it then cooled it. I also forgot about them and they sat out an extra day maybe 2. What did I do wrong? So i dont mess up next time. I have them in frig now we did like them very much so i hope the ones i have are safe to eat. Don’t leave it out so long on the counter. If the cucumbers are still in the brine, they should be okay. Sorry, I’ve only used cucumbers. can you put them in refrigerator after one day? I suppose, and if your house is really hot it would accelerate the pickling process so that would be a reason to do it. Under normal conditions, you want to leave them out a little longer so the flavor is stronger. my house stays about 72 degrees year round, just saw an earlier post about mold forming and it worried me about leaving them out three days…..what does it hurt by putting them in the fridge right away?? does it affect anything with the taste? I have not tried putting the cucumbers directly in the refrigerator, but I believe it would likely slow down the pickling process. If you want to put the pickles straight into the refrigerator, I would definitely leave them in for at least two weeks to allow the flavor to develop.